The pilot is reported to have ejected safely from the plane. A Russian MIG-29 fighter jet crashed into the Mediterranean on 14 November while on the approach to land on the deck of the Admiral Kuznetsov aircraft carrier, the TASS news agency has quoted the Russian Defence Ministry as saying in a press release. "An air accident involving a sea-based MIG-29K occurred as a result of an equipment fault during an approach for deck landing several kilometers away from the aircraft-carrying cruiser Admiral Kuznetsov," according to the ministry. 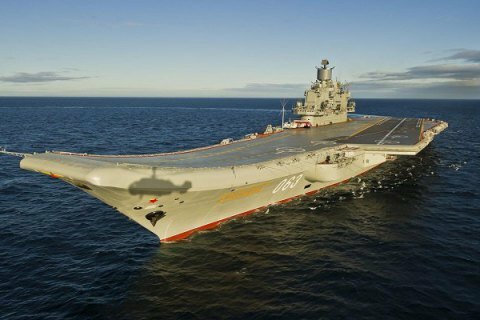 "The pilot ejected himself from the aircraft and was taken to the Admiral Kuznetsov by a crew of the search and rescue service," the press release said. "His health is not in danger and he is ready to perform further tasks." The flotilla of Russia’s North Fleet that left a mission in northwestern Atlantic and the Mediterranean on October 15. It includes the Admiral Kuznetsov aircraft carrier, the heavy nuclear-powered missile-carrying cruiser Pyotr Veliky, the big antisubmarine ships Severomorsk and Vice-Admiral Kulakov, and auxiliary seacraft. Saakashvili: "People want change, it would be irresponsible not to help"